For us—without our being aware of it—the significance of clouds is elemental. In their ephemerality and undefined multiplicity, we inscribe our wishes, hopes and fears. From the Middle Ages onwards, and increasingly in the 19th century, people have ascribed new functions to clouds as a motif in the firmament of western painting. This becomes visible, for instance, in the works of the English landscape painter, John Constable, or of William Turner, as well as those of the German Romantic, Caspar David Friedrich. They do not merely depict the phenomenon or commit clouds to religious meaning of an abstract proof of God’s existence, but they develop them into a dynamic pictorial subject in their own right. Their characteristics, such as movement, change or dispersibility make them into “icons of the moment” (John Constable). The artistic “discovery” of clouds parallels their increasing importance in the natural and human sciences. As the French art historian, Hubert Damisch, puts it, clouds mask “an unrepresentable infinity and, at the same time, denote it, (…) and can in this way secure the paradoxical balance of a pictorial institution being closely bound up with the stipulations of science.” In the context of the 20th century’s globalisation, virtualisation and theory, clouds have become a distinctive model for paraphrasing the complexity of contemporary conditions of life and have even been stylised into a symbol of a networked architecture of information. 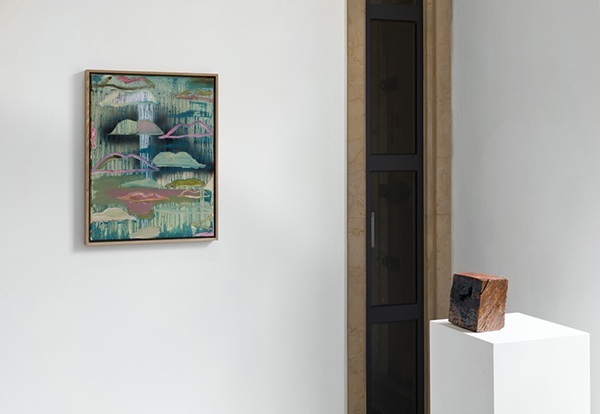 Since 2012 Benoît Maire has been focussing on the art historical motif of clouds in painting. He was previously well known for his work in sculpture, film or with texts and has only begun painting again ten years after finishing his studies. His paintings are at first sight no more than what they depict: Cloud Paintings. 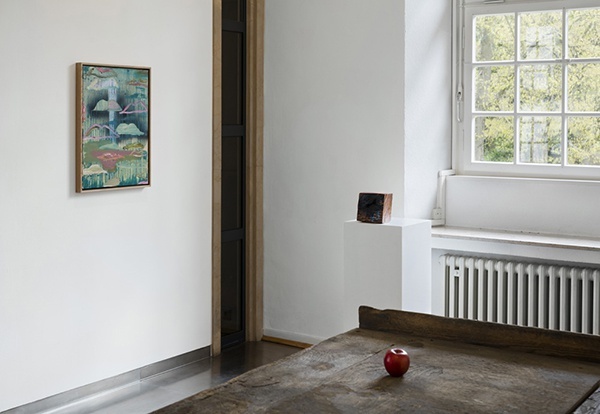 Small- and large-scale paintings, partially arranged in groups, spread out through the four spaceson the ground floor of the Bielefelder Kunstverein. Maire also terms them “paintings of the evening”, and they gather up both the moods of the light as evening falls and its changing atmospheres. Constellations of clouds appear in a multiplicity of forms and colours. They move between figuration and abstraction. The process of Maire‘s painting is marked by chance and control. The actual motif develops through several phases, but also through the conscious application of various painting techniques. He paints on a white ground, as well as on unprimed, open-pored canvas. Colour is applied both flat and astose in equal measure. It varies in the brushstrokes, is sprayed on, sometimes stripped away with a blade or becomes liquid. Maire does not just invoke and vary the motif but also the history of painting techniques and the blending of styles. Clouds were once described as the “schoolmasters of painting”, and how he deals with the subject thus illustrates Maire’s own artistic development. However, it should be noted that here it is neither a case of a naturalistic representation or of painting as illusion. The paintingsthemselves remain as fragments and reveal the process of their development just as much as their blank spaces. As a matter of principle, Maire’s works evolve in a middle-ground between art and philosophy, showing and thinking. He takes up authors like Alain Badiou, Arthur C. Danto, Jacques Derrida or Gilles Deleuze and develops forms of expression to translate their philosophical reflections visually. In this process, he is interested in the potential of the visual arts and the semiotic relationship between concept, sign and object. The possibilities of the painterly gesture, its effects and clichés combine in the cloud paintings with the intellectual history of the West. In the first instance, clouds elude any rationality. They are constantly changing and dispersing, becoming symbols of immediacy and fantasy. Maire takes on clouds as his subject and goes into what painting them involves to focus on their expressivity for today. Maire’s approach involves a decisive role for indexes, or respectively the act of indexing. The index finger, the Latin root of the word, is at once an artistic measuring device as well as a concept. Maire follows the theories of the French philosopher, Alain Badiou, so that the index serves to denote the the incidence of an artistic process. The index finger pointing upwards, a reference to da Vinci’s painting of John the Baptist, becomes the symbol of a transcendental gestureof creation and an act of presentation. Initially applied just as a sticker, this same gesture now reappears in a three dimensional form in the series of works entitled Main (2015). The 3D model of the Baptist’s hand was, in one case, machined from untreated wood and, in another, milled from a block of marble. Ultimately, it is the waste that attracts me, and perhaps it is this particular waste that is linked to the strongest ontology, as it is the reverse of the teleological ontology which guides my objects through decisions. The non-decided as it is non-decided, is what contains the greatest po wer. A power that we cannot delineate, nor can we name it because it is unrelated to any decisions arising from the naming process. All that we can do then is to index it, to point it out with a finger.” Whilst Maire denotes the refuse as such with stick-on letters and words like “the”, “those”, “forgotten”, the selected works exist solely in their dimensions, forms and materials. 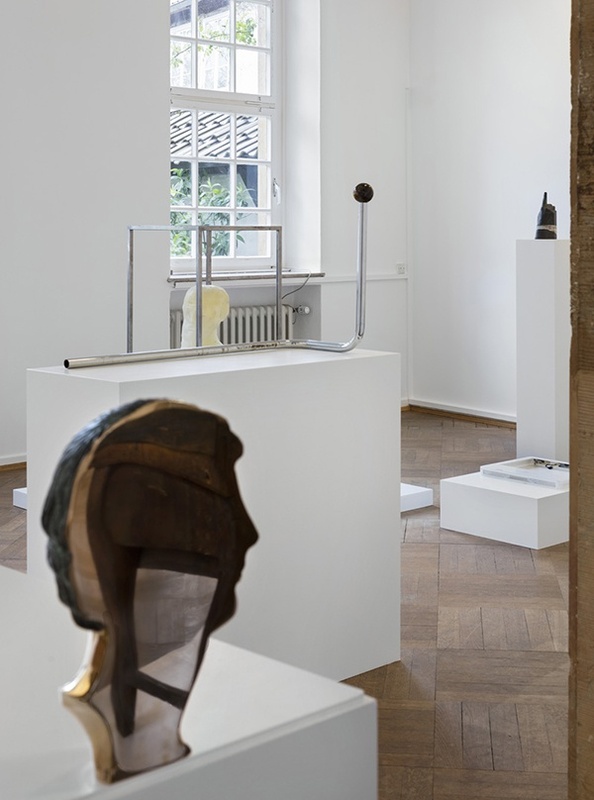 In a dialogue with painting, Benoît Maire is presenting new sculptures and transformed objects at the Bielefelder Kunstverein. 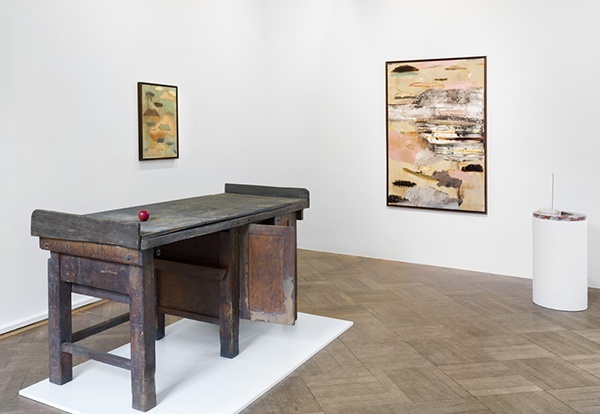 His three dimensional collages and assemblages move, in terms of their form, between Minimalism, Concept Art and Arte Povera. Industrially produced or found objects from everyday life combine with his own artistic production. And here too, gestures and fragments are dominant. 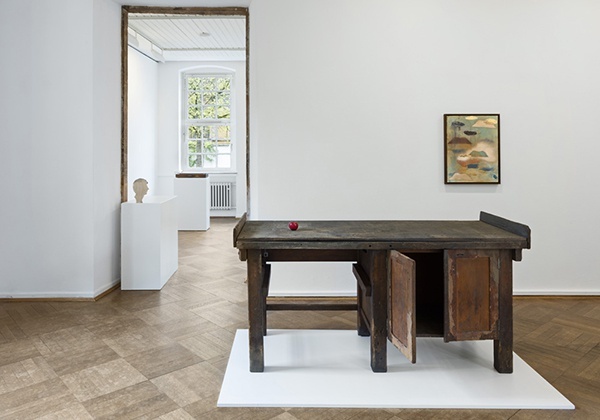 In his work entitled Oubli (2015), he combines an antique portrait made from concrete with a granite cube and a computer keyboard. The head, the capital, resembles the classical composition of pillars, as it rests on a technological shaft and a natural basis. The head of Socrates (2016) is also untypical for a bust, being cast not in bronze but in fragile glass. That makes it perceptible only in outline, but opens up a view of what is inside, a hammer and some successors to the hand-axe. In earlier works, Maire had already transformed castings of antique sculptures into soft, unstable materials, thus bringing the paradigms and the roots of this genre into question as regards the aesthetics of its materials. The formal register and the confrontation with sculpture also continue in the exhibition. 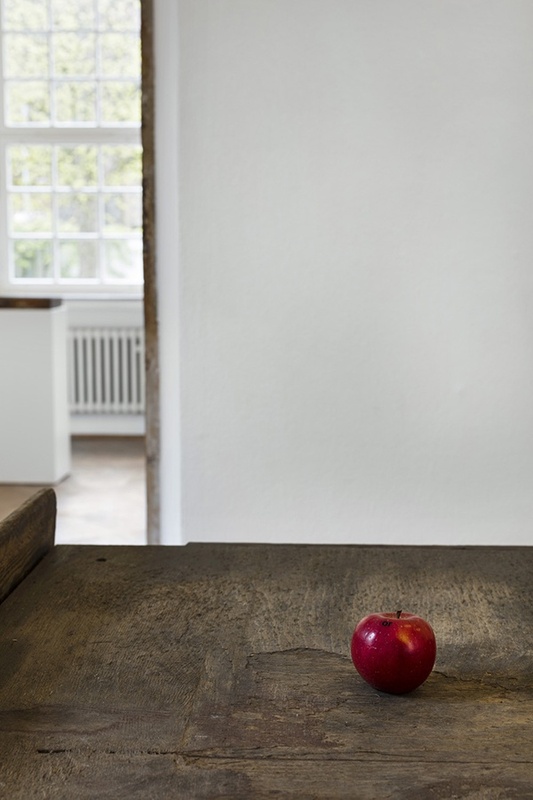 Furniture such as tables or chairs supplement the classical presentation on pedestals and gain a sculptural function alongside their utilitarian one. 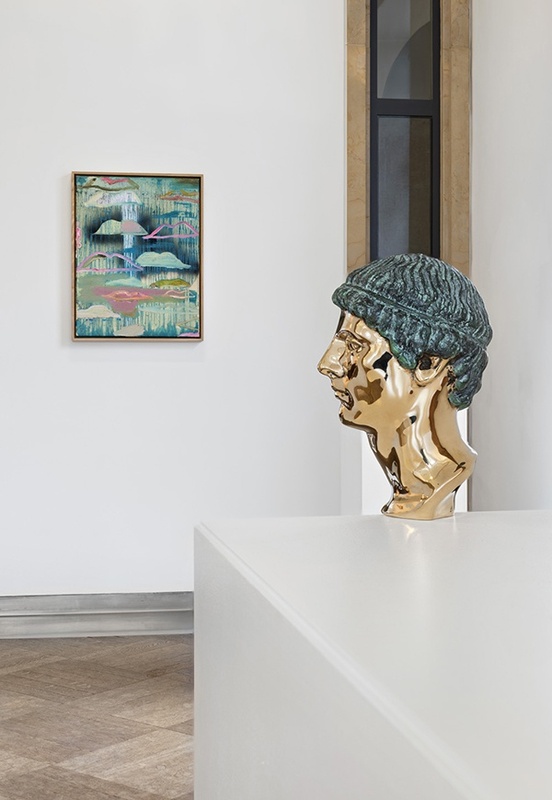 Maire combines small sculptures in equally heterogeneous assemblages and uses the peculiarities of the Benoît Maire’s works are marked by an abiding interest in the current status of art and a reflection on his own practice. His paintings, sculptures, films and installation arrangements seek an experimental and practical access to basic theoretical questions of art’s aesthetics and its use: what sort of art is evolving from our present-day situation? What does it mean to be an artist? What would happen, if all the artistic decisions in a work were still adhering to it? With Maire, these questions and ideas find themselves translated in the form of pictures and objects. In recent years, he has accordingly developed his own artistic language, which he has extended through painting and has refined as regards its expression. His spatial compositions are characterised by selection, organisation, condensation and contrast, as well as their modes of display and presentation. However, he questions patterns of perception and of the consequences of human decisions, with their meanings and ascribed connotations. 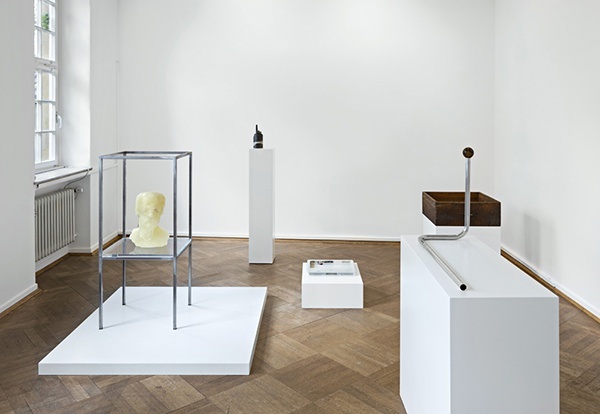 Differing materials and registers of things are embedded in installations and enter into a conscious relationship to each other, becoming equal parts of an artistic index, which lends meaning to what is obsolete using art’s techniques and, at the same time, poses to itself the personal question as to what representation is (in art) still relevant today. Finally, this becomes clear in how he deals with the exhibition’s title. “George slays the dragon” once again links up with a motif’s particular history and a religious theme. The Roman martyr and dragon-slayer, St. George, a favourite motif in art and today the patron saint of many countries, faced the audacious battle with the dragon alone, so the legend goes, in order thus to free humanity from evil. 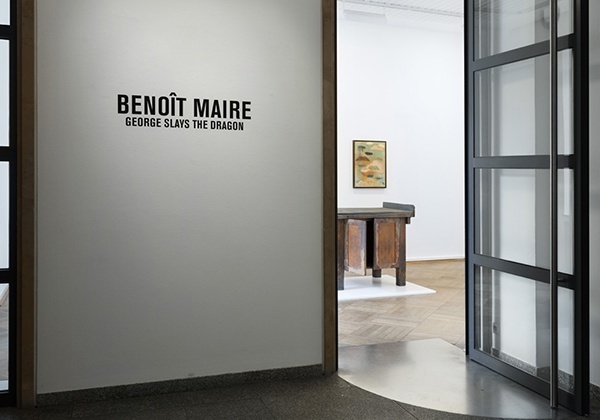 The title does not serve Maire as an advance notice, a distillation or an explanation of his presentation, but the literal designation and the picture we associate with it become an independent component of the exhibition.